It's impossible to keep secrets these days. Kia has been attempting to build anticipation ahead of the launch of its redesigned 2019 K900 . But the internet has other plans as photos of a fully uncovered model have popped up on after an eagle-eyed car spotter noticed the K900 on the back of a flatbed truck somewhere in South Korea. In contrast to the sporty Stinger, the 2019 K900 will act as the more mature, measured, and elegant flagship for the brand. The exterior seems to match the tasteful interior sketches the company recently showed. The images are extremely grainy and low quality, but they’re still capable of showing how the full-size sedan’s design has stayed true to the original sketches Kia teased earlier. Like the drawings, the car adopts more rounded headlights and taillights, with a new beltline seam splitting the car just beneath the side windows. As you would expect, there’s integrated dual exhaust outlets, alloy wheels, and a tasteful enough amount of chrome trim. 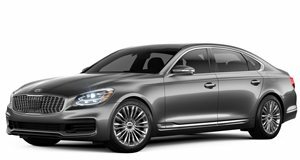 The K900 is expected to share a platform with the Genesis G80 and G90, and will also likely share most powertrains with its sister brand. Engine choices could include the company's 365-hp twin-turbo 3.3-liter V6 and the 420-hp 5.0-liter V8. Both motors should also be paired with a 10-speed automatic transmission. Look fort he 2019 K900 to be offered in rear-drive configuration as standard, with all-wheel- drive being an optional extra. Given it’s luxury positioning the car is also likely to feature a laundry list of driver assistance systems with the potential for semi-autonomous technologies as well. If you’re interested, look for the 2019 Kia K900 to poke its head out at the 2018 New York Auto Show in just a few weeks time.